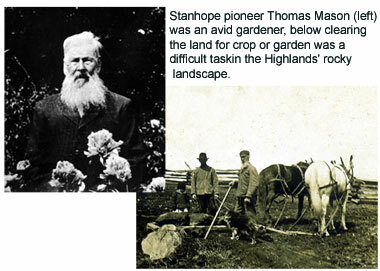 The idea of the Stanhope Heritage Garden came to fruition in February 2001. The Heritage Garden contains plants of historic interest to Stanhope Township. Some plants are native to this region and settlers have brought others in. The garden pays homage to the pioneers who adapted their farming and gardening knowledge to this climate at the height of settlement in the late 1800s and early 1900s. The Heritage Garden consists for four different sections: the Perennial Garden, The Herb Garden, Trees, and the Vegetable Garden. It’s a constant work in process and we welcome your frequent visits throughout the flowering season to enjoy the latest blooms.